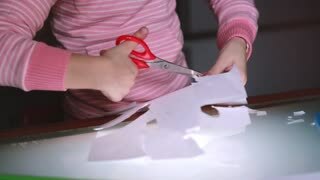 Close-up shot of little girl's hands in pink sweater cutting paper sheet shapes with scissors on a glass table. 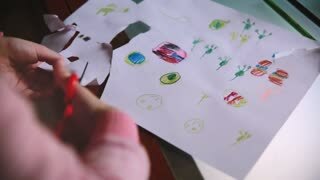 Camera sliding left on hands of little girl child in pink sweater cutting paper shapes at table with various stationery. Close-up shot of cute little girl's hands cutting handdrawn pictures out from a paper sheet with scissors at a table. Adorable little Caucasian girl in pink sweater drawing shapes with a pencil on a sheet of paper, talking to someone. Close-up shot of little girl's hands in pink sweater creating funny character shapes from paper and glue on a table. Close-up shot of cute preschool girl in pink sweater cutting shapes with scissors from paper, reflecting in glass table. 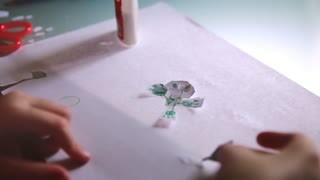 Close-up shot of preschool girl hands in pink sweater cutting shapes from paper with scissors and drawing with a pencil. Cute little preschool European girl child in pink sweater cutting her drawing out of paper sheet, talking to someone. Close-up shot of cute little girl's hands in pink sweater cutting paper shapes with scissors and drawing with a pencil. Close-up shot of cute little girl's hands in pink sweater cutting shapes from paper, glass table reflecting her face. Beautiful little preschool European girl in pink sweater sitting by the table at home alone cutting shapes from paper. Beautiful little female preschool European child in pink sweater sitting by the table at home cutting paper shapes.